On our first vacation to Hawaii we were greeted by our hosts with a meal of fresh papaya. The papayas were cut in half with the seeds scooped out. A large wedge of lime was placed on top. 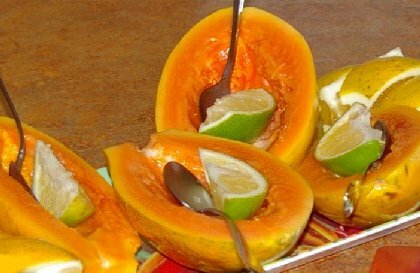 All we had to do was squeeze the lime juice over the orange flesh and devour the fruit by the spoonful. For our two week stay this was pretty much our breakfast each day. To accompany the papaya we also had whole wheat toast (like that from Roman Meal) with local tropical jams. Papaya is a one of the Superfoods. Papayas have a texture much like ripe cantaloupe with a slightly sweeter taste. With lime juice drizzled over the meat the aroma has me reaching for a cold tropical drink that isn't there. Papayas are a source of antioxidant nutrients such as carotenes, vitamin C and flavonoids; the B vitamins, folate and pantothenic acid; and the minerals, potassium and magnesium; and fiber. These nutrients promote cardiovascular health and may provide protection from colon cancer all at minimal costs. We found papayas at the local markets for a price of two dollars for five papayas. Where else can you find healthcare for forty cents? In today's transportation world, papayas are not that far away. They can be found in most markets all year long. In Hawaii they can be found in the local farmers markets almost any time. 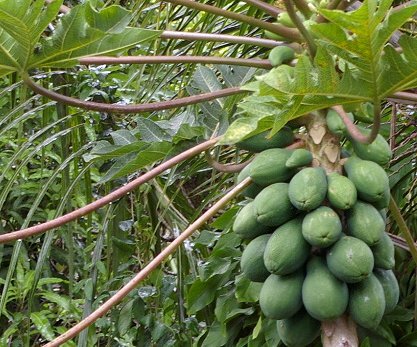 Papaya trees produce fruit all year round. As our hosts drove us around the Big Island we saw people picking up fruits along the road. This photograph was taken at a small fast food restaurant in Kalapana. We didn't pick fruit, but we purchased papaya flavored ice cream that was excellent. A papaya sorbet would make the end to a great meal almost anywhere. 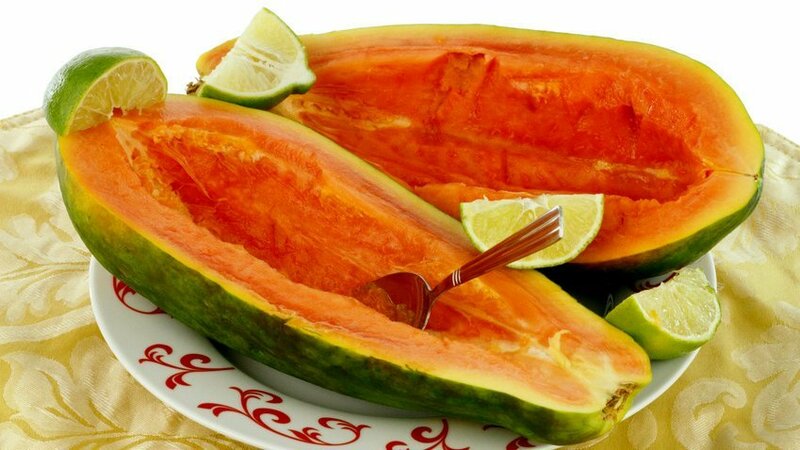 Originally, the papaya came from Mexico. It was introduced into Hawaii in the early 1900s. 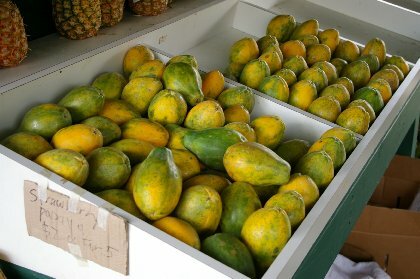 Hawaii is the only state to commercially produce papaya. Mexican papayas can weigh as much as ten pounds, while Hawaiian papayas weigh about a pound each. Hawaiian papayas are what you see in your local grocery stores. A friend of mine had a closer relationship to papaya than I have had. He was having back problems. The pain was driving him crazy. Green papaya fruit and the leaves of the papaya tree contain papain, and enzyme, which has been used as a meat tenderizer for centuries. 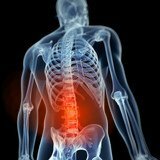 My friend, George had injections of papain for a herniated disc. Perhaps, it only works with people named George or from Indiana. Harrison Ford had the same treatment after filming one of his Indiana Jones feature films, Indiana Jones and Back to the Future? Maybe not. With its deep carrot-like color, the papaya is a carotenoid. The Linus Pauling Institute has this advice for for carotenoids users, "Chopping, homogenizing, and cooking disrupt the plant matrix, increasing the bioavailability of carotenoids " This means that the papaya, while good for you raw is even better for you cooked a little bit. 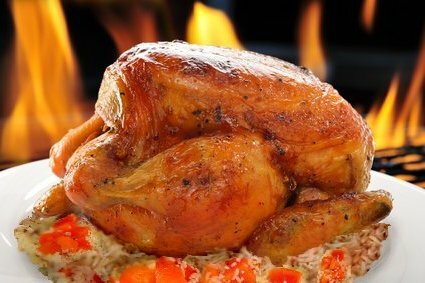 So, you might try both green papaya salad (excellent) AND green papaya spaghetti or papaya stuffed chicken with basmati rice . . . and perhaps papaya sorbet for dessert. Papaya nutrition. benefits papaya, papaya superfood, papaya back pain, nutritional benefits of papaya, Healthy Aging Healthy Living Article.